Our 10th Medium-Term Strategy has five pillars that influence all areas of the Institute’s work and serve as guiding principles in implementing our mission. The five thematic areas are social inequalities, learning outcomes, education system resilience, governance and accountability, and education financing. Discover all of them in our strategy. An estimated 263 million youth are out of school worldwide. Barriers to education arise chiefly from poverty, but also include ethnicity, gender, disability, and crises. It is estimated that some 15 million girls of primary-school age will not have the opportunity to learn to read or write in school, compared with 10 million boys.Even in countries where girls have equal access to education and higher graduation rates than boys, this advantage too often fails to translate into economic empowerment. At the same time, there is a need for deeper analyses of the factors that make boys more likely to leave the education system, and the consequences. Inequalities remain a serious concern for most countries, and have worsened even in some wealthy societies. Reducing these, especially inequalities of gender, is a prerequisite to guaranteeing the right to a quality education for all, as reflected in SDG 4. 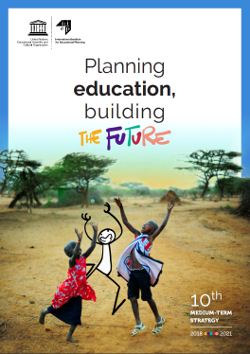 Educational planning and management should lay the foundation for improved policies for inclusion, as well as socio-economic development. Beyond strategy design, efforts must be made to involve disadvantaged groups in policy formulation and planning processes. 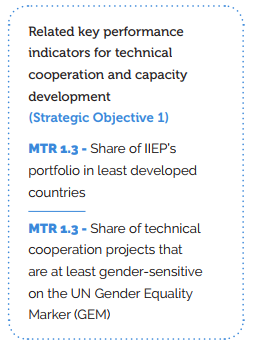 Under the 10th MTS, IIEP renews its commitment to equity analyses in sector analysis, sector plan development, M&E, and policy research. This will involve interpreting data on gender, socio-economic status, ethnicity, urban–rural disparities, language, and disability, and their role as obstacles to education. IIEP’s training will encourage attention to all forms of disadvantage, including disability. The Institute will also work to develop the technical planning and management capacities of female education staff, enabling and encouraging them to advance to high-level positions. More equitable gender representation in the design of education systems can contribute to policies inclusive to all. Promote increased attention, in education sector analyses and plans, to gender as it intersects with other causes of inequality. Mainstream gender and other equity issues across IIEP’s training offer. Develop a new training offer on planning for inclusive systems, with a focus on people with disabilities. Make available to policy-makers applied research on reaching the poorest and most marginalized groups. Read our 10th Medium-Term Strategy!